I first discovered Prairie Rock back in late 2002. To be honest, I believe it may have been my first introduction to local microbrews. That makes it hard to write this review, because I fell in love back then, but now the infatuation is over. I have been to Prairie Rock many times. In fact my wife and I even had our wedding reception in The Loft upstairs in June 2003. We had a great time and I would still recommend that space as a good place for a party. The problems with Prairie Rock started with their inability to find a successful model for the restaurant. It was once a nice place to get a steak and some beers. Then they turned it into some gimmicky place where you were supposed to cook your own steak on some big communal grill. Now, they have given up on the big central dining room altogether and relegated all food service to the bar atmosphere. This is a shame, because the giant fireplace and surrounding loft provided a pleasant atmosphere. The menu has been reduced to pub grub. I must admit that I was driven away from Prairie Rock by the cook your own steak days, although I went back occasionally in the hopes that it would be better. It never happened though. On the contrary, I ended up finding a lot of places with much better beer and so my visits became less frequent. That brings me to my most recent visit, which was the catalyst for this review. On the evening of 11/07/2008, we decided to check in on Prairie Rock. It may have been 3 years since our last visit and we were curious about what we might be missing. The first thing I noticed is that the parking lot across the street is gone. I'm not sure where people are supposed to park now, but we got lucky with a street spot right in front. Of course this luck was probably due to the fact that there were hardly any customers, as we would soon discover. Entering the bar, a sign directed us to seat ourselves. In a short time a waitress came to take our order. To reacquaint ourselves with the beer, we ordered a sampler. Prairie Light - slightly better than your typical macrobrew, maybe because it was fresh. I generally dislike this style of beer, so I would not order a whole pint. Pale Rider Ale - definitely hoppy, but not enough complexity to make it great. It was drinkable, especially compared to the light that I started with. Triple Nickel Stout - the first thing I noticed about this beer was the bad smell. I don't know how to describe it, but at first I thought the beer had gone bad somehow. I gave it a sip anyway because I really like stouts and I wanted this to be good. It had a hint of the flavor I was looking for, but overall I found it to be watery and uninspired. It was served too cold also. Clocktower Amber Lager - Mmm... so malty! I was surprised by the flavor of this one. It had a nice toasted flavor and the amber color was rich and pleasing. This is not usually my favorite style, but it stood out compared to the disappointments that I had sampled earlier. Vanilla Creme Ale - this beer smells like candy, which depending on what you want out of beer may be a good thing or not. I was open to the possibilities. It had been a few years since I had it and I tried it as if for the first time. The taste did include a mild hint of vanilla, but nowhere near as strong as the smell would lead you to believe. I found this beer to be too carbonated for my tastes, which made it seem a little sour on my tongue. The smell and the taste are at odds with each other in my opinion and this makes it hard to enjoy. Hefeweizen - this was a pretty boring example of the style. It was a little malty and wheaty, but it stopped short of the complexity I expect from a Hefeweizen. Absent was any hint of citrus or bananas or anything. I would not get this one again. Based on the sampling, I decided to dive into a full beer for a better experience. I ordered a Clocktower Amber and my wife had the Pale Rider. By the time we finished them, the feeling was that we had endured the beer more than enjoyed it. I was sad to come to this conclusion. We also had a little food along with our beer. We started with the artichoke and spinach dip. It was delicious and came with a very generous portion of dip and warm flatbread triangles. Later on we ordered a tomato pizza, which oddly enough did not seem to have any sauce on it. The crust was thin and a little pasty. The whole pizza was tasteless and disappointing. The atmosphere for the evening was a little depressing. 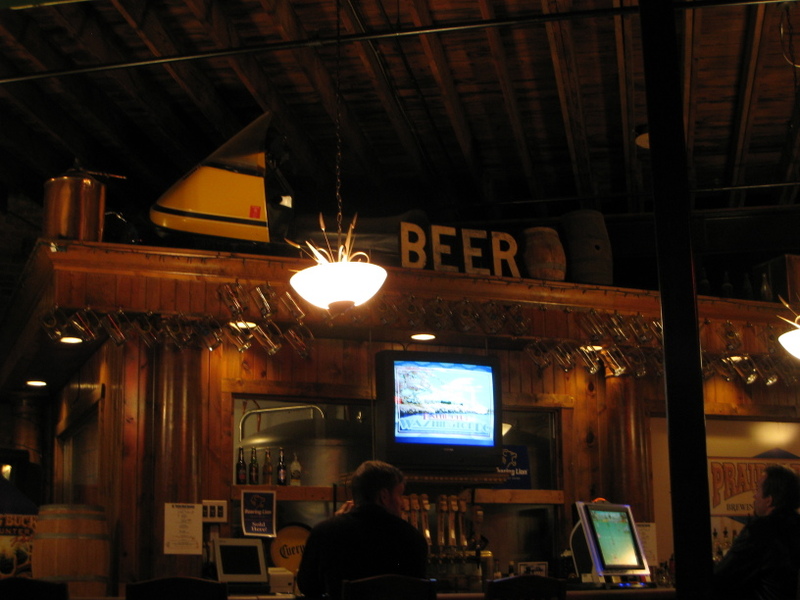 The bar is the only seating area that Prairie Rock still has open to the public. On a Friday night it was pretty dead. I normally avoid big crowds, but this place felt like most everyone else, except us, had gotten the message that the end was near for this pub. On top of that, we had the misfortune of sitting in a booth that was freezing. We didn't realize that despite there being two sets of doors for the entrance, the "top" of the space between them was open. So every time someone held the outer door open, a blast of cold air would shoot up and then down onto us. Overall, I could not recommend this place. I will not be returning unless I were to hear of a significant overhaul of the brewery and the restaurant. 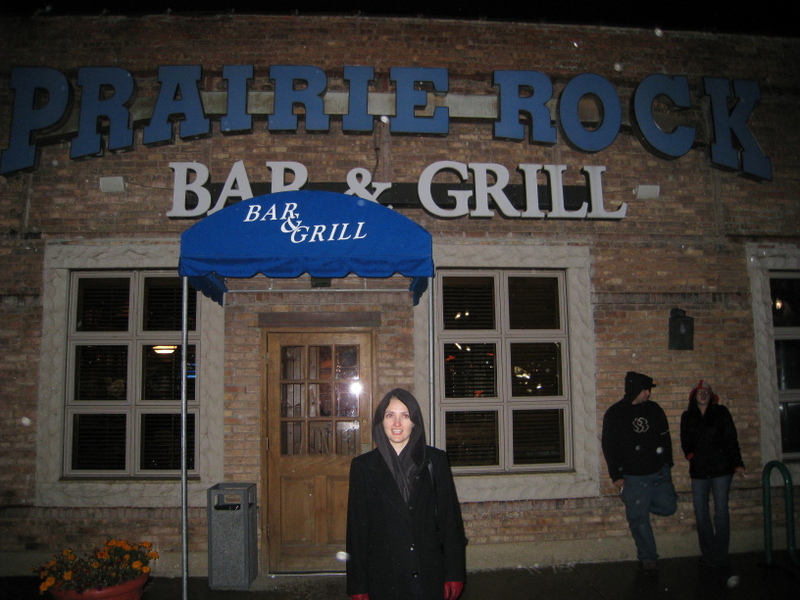 The northwestern exurbs' first quality beer destination was the Prairie Rock Brwg. Co. Located in downtown Elgin, it opened in 1995. It sometimes gets lost in the shuffle, or plain forgotten, when area beer aficionados count the number of brewpubs here. Which is too bad. Without Prairie Rock, I dare scribe neither Brass nor Millrose Brwg. in South Barrington [more on them later] would be around and functioning. A last-minute addition: The venue has _closed_ its 'main dining area'. You will view it as you stroll from the bar to the washrooms. There has not been sufficient business here for it to be opened. I'll change things up a bit here by commenting on this venue's _food_ first. Prairie Rock has a World-Wide Web site. It has not been revised in a while. But its food menu page is on-line, and relatively current. I determined for the Barbecue Chicken Pizza. It had small cuts of white meat chicken atop a consistent, gooey cheese layer. Mixed in with the chicken was diced onions. It was not too tomatoey, which is my preference as far as pizzas go. It is individually sized, ten inches round (eight pieces). It is served with two topping shakers: Grated cheese, and red pepper seasoning. I tried both. This pizza does not need the additions, but you could enjoy the red peppers if you want a spicier mouthfeel. The pizza itself would get a 3Â¾-star rating from me. There are other food items on the menu. The pizza ($9.95) is in the center as far as pricing goes. On to the beers. There are four regular brews here, and usually two seasonals. 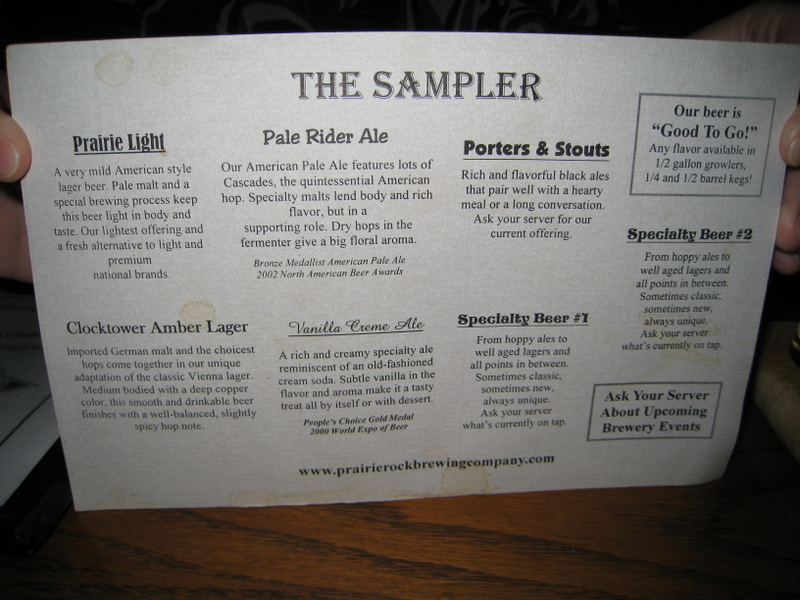 The current seasonals are a Hefeweizen, and a Prairie Porter. I had the porter. Unfortunately for me, this was a smoked porter. Smoked beers are a creative interpretation of whatever style on which they are based. It takes extra skill from the brewmaster to ensure that he | she does not smother the base flavor of it with the aroma and taste of smoke. This was a good example of a smoked porter. By that I mean; I struggled valiantly, but I could not finish the glass [16 ounces]. If my enemies ever capture me, and want to creatively torture me, what they should do is to force me to drink smoked beer. Deep, deep secrets could eventually be revealed (if that's what they desire). If you enjoy smoked beers, you are hereby entitled to 'my share'. It was dark brown, clear (all the beers I had were clear). It had a malt aroma. Smoke hits in the taste as it warms and prevails in the aftertaste. I did not have the hefeweizen. Someone down the bar from me had one. It looked slightly cloudy, and it included a lemon wedge. My favorite beer here was the Vanilla Creme Ale. It was pale gold, had smooth mouthfeel and taste throughout. A vanilla flavor hits in the taste and prevails throughout. This is a very good session beer. I had three. The other beer I had was the Clocktower Amber Ale. This was dark amber. It had a slight malt aroma. This was a very balanced beer in which neither hops nor malt eventually prevailed. If your tastes tilt toward mainstream beers, or beers like Leinenkugel's or Dundee, you will like this beer a lot. This would be another good session beer. You can order growlers to take away from here. You should telephone the venue to ensure they have the growlers in stock (if you don't have one from another brewpub, which it shall fill), because it completely ran out of them while I was there. There is also a 'mug club' which you can join if you intend to visit here on multiple occasions. Similar to the snag with Rock Bottom Chicago, downtown Elgin is being renovated. (!) You will encounter gravel paths where unfinished sidewalks are. [Why doesn't Prairie Rock have a "Renovation Ale"?] But you should be able to stroll through it. It is a 4Â½-block walk east and south, across the Fox River, from the Elgin station. There are twelve trains each way on Saturdays, and eight trains each way on Sundays. Figure a two-hour interval, with some additional trains on Saturday on a one-hour interval. The last trains departing Elgin are at 8:10 and 10:10 pm. Seems like such a weird place for a brewery, but I stumbled across it while driving around on a trip to Chicago. The place seems to want to be more of a sports bar, and also seems to get most of its customers from the nearby casino. The beer wasn't great, and most of their selection was on the lighter side, but it was a nice surprise to find the place. The atmosphere was more, like I said, sports bar. Lots of TVs, White Sox and other team banners, concrete floor and a relatively small bar. Parking is available on the street, but there's not a whole lot. There's a huge garage just down the street for the casino though.